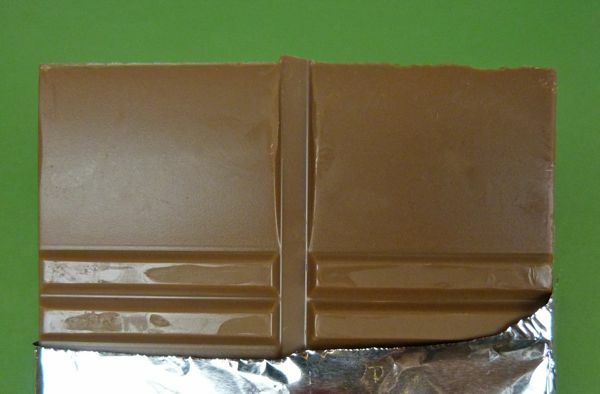 Today was Day #6 of Milk Chocolate Theme Week. At the beginning of this week, I asked myself: How low can I go in terms of cacao percentage and still taste and enjoy authentic chocolate flavor? 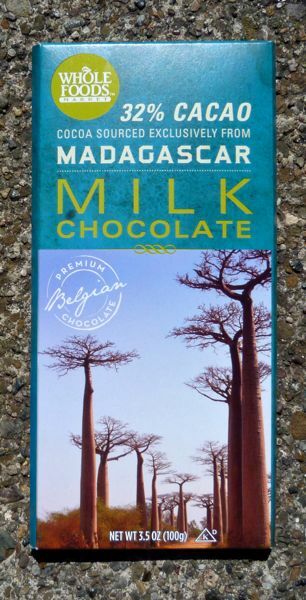 This 32% cacao Milk Chocolate bar from Whole Foods Market, with packaging adorned with an image of baobab trees found on the Island of Madagascar, was the lowest cacao percentage bar this week. 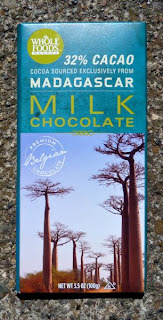 Made from cocoa "sourced exclusively from Madagascar" that was "prepared and poured by Belgian chocolatiers" (who added milk and sugar), this bar was certainly sweeter than I was used to; however, it scored better in a blind taste testing than some other commercial bars that had similar percentages in the low thirties. There was a very slight honey vanilla flavor to this bar, and a smooth milk flavor and mouthfeel that may be due to Belgian technique. I don't know whether the "natural vanilla flavor" came from Madagascar or not, but the large island nation off the southeast coast of Africa, is also known as a quality supplier of this flavorful pod.